Dentures are used to replace missing teeth which can be removed and put back into the mouth. 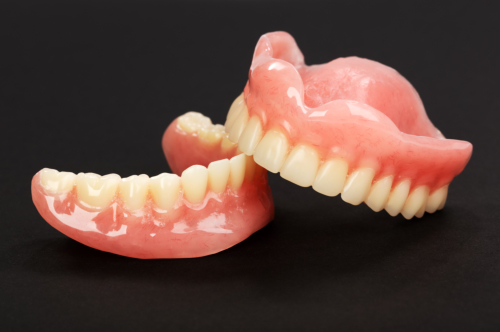 Although dentures take some time to get used to and won’t feel exactly the same as a person’s natural teeth, dentures these days look natural and are more comfortable to wear. Dentures can be partial or full. Dentists at ORCHID Family Dental will help in picking the kind of denture which is best for you based upon whether all or some of your teeth will be replaced and the cost this treatment option involves. Having full dentures leave you having flesh-colored acrylic base fitting your gums. The upper denture’s base covers the palate while the lower denture is made with a horseshoe shape in order to accommodate the tongue. Dentures are custom-made from impressions your dentist takes of your mouth. There are three kinds of dentures you will have to choose from. Traditional full dentures. These dentures are placed in the mouth after the removal of any remaining teeth and healing of tissues. It is likely that healing takes many months. Thus, you will have no teeth during such months. Immediate full dentures. These are inserted right away following the removal of the remaining teeth. During an earlier visit, your dentist will take measurements and create models of your jaw. Although immediate dentures provide the benefit of not having to experience without teeth, they need to be relined many months following insertion. This is because the bone that supports the teeth reshapes when it heals which causes loosening of the dentures. Partial dentures. These dentures rest on the metal framework which attaches to the natural teeth. Some dentists place crowns on a number of the natural teeth and act as denture anchors. Partial dentures are removable alternatives to bridges. You may feel uncomfortable or awkward with your new dentures for the first few weeks or months. You may have to take a bit of practice as you eat and speak with dentures. A loose or bulky feeling is common while the cheek and tongue muscles learn to hold the dentures in place. It is also common for denture users to experience an excessive flow of saliva, a feeling that their tongue doesn’t have enough room and minor soreness or irritation. In case you experience irritation, make sure you inform your dentist right away. As you handle the dentures, stand over a basin of water or over a folded towel. Dentures tend to be quite delicate and are likely to break when dropped. Never allow the dentures to dry out. Put them in a plain water or denture soaking solution if you remove them from your mouth. Avoid using warm water because it can warp the dentures. Brush your dentures every day to eliminate plaque and food deposits and prevent them from becoming stained. Although you can use an ultrasonic cleaner to care for your dentures, it doesn’t replace a thorough daily brushing. Brush the gums, palate, and tongue each morning using a soft-bristled brush before inserting the dentures. This helps in removing plaque and stimulates tissue circulation. Visit your dentist in case your dentures break, become loose, crack or chip. Never try to adjust the dentures by yourself if you don’t want to damage them further. This entry was posted in dental, dental care, dental sevices and tagged cosmetic dentistry, dental care, dental health. Bookmark the permalink.